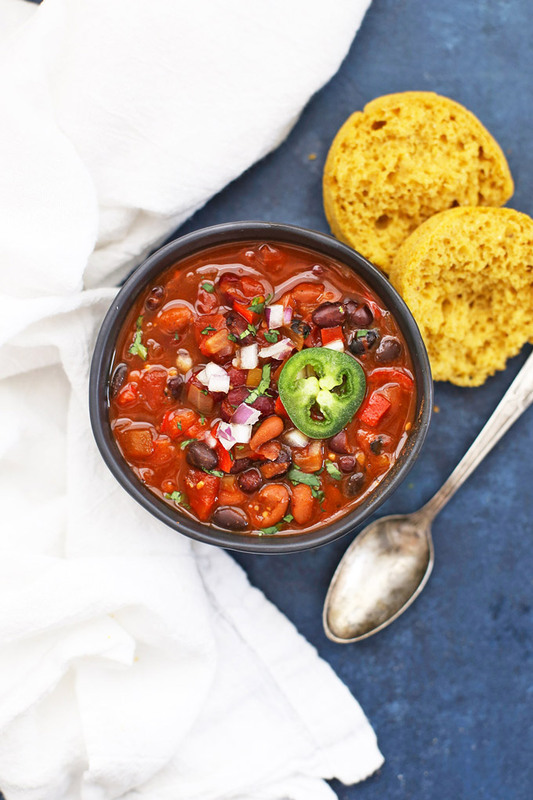 Vegan Chipotle Black Bean Chili – This easy vegan chili packs a flavor punch! We love all the color and flavor, and love even more that you can make it using an Instant Pot, slow cooker, or stovetop. 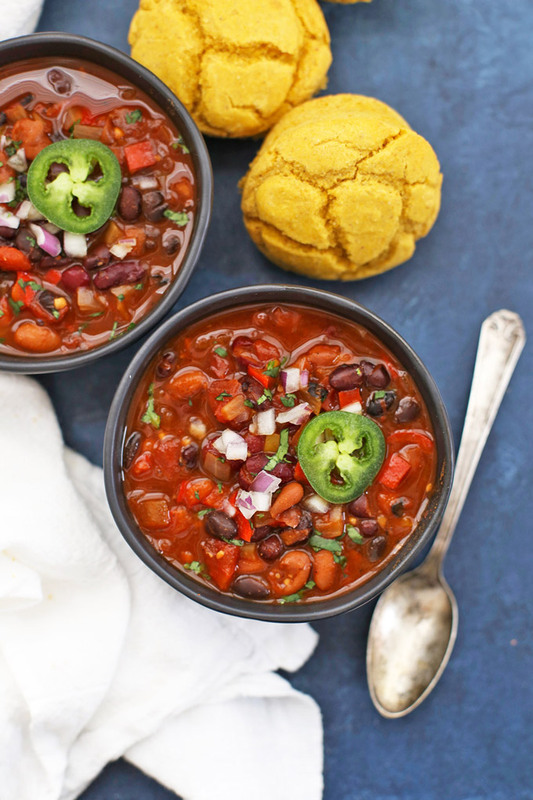 Chilly weather is chili weather, and even though we’re not what you’d call cold here in the desert, we ARE making the most of the cooler weather by cooking ALL the cozy fohods. Even if we’re not bundled from head to toe, it’s nice to warm yourself up with something cozy every now and again, isn’t it? I’ve had a lot of lackluster chili–either WAY too spicy without enough flavor, or bland, or watery, or WAY too thick, etc. Then, I’ve had some GREAT chili, like this classic version, or this Pumpkin Chili (which is one of my all-time favorite recipes EVER on this blog). My ideal chili has plenty of flavor, a little bit of heat, and is easy to put together. 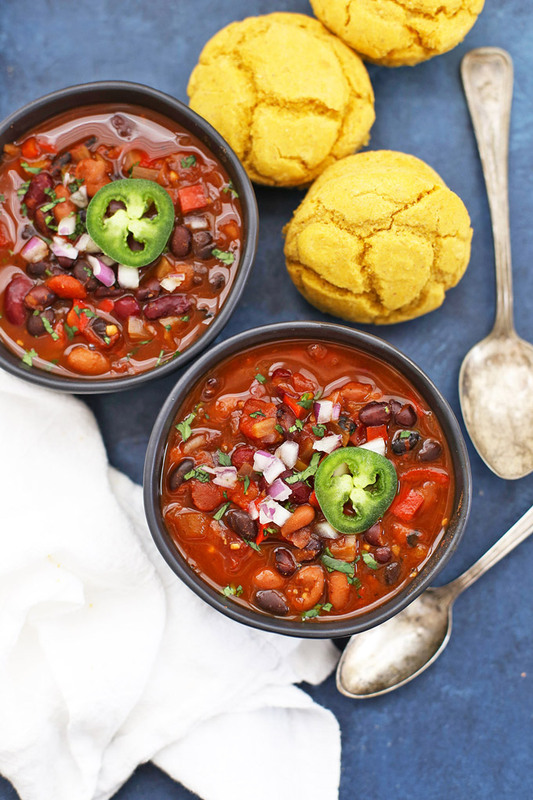 This Vegan Chipotle Black Bean Chili hits all of those points for me. It’s meatless/vegetarian and packed with veggies, has just the right heat (which can be easily scaled up for a spicier version, or scaled down for a mild one), and it can be made on the stovetop, or in the Instant Pot or Slow Cooker. I start with a pretty substantial base of veggies–plenty of bell peppers, some onion, garlic, etc. Then, I fill things out with a trio of beans–red kidney beans, pinto beans, and a double dose of black beans. I love the color this brings! Lastly, I pull things together with crushed tomatoes (they give just the right texture!) and a mix of spices. For spices, I start with the usual suspects–chili powder and cumin–then rounded things out with some chipotle chili powder and smoked paprika. I love the smokiness from the paprika and the chipotle chili powder is what gives this dish its heat. It’s a really nice quality level of heat. Michael gushed the whole time he was eating it–“this is so good! I can’t believe it’s vegan!” and I couldn’t help but agree. Our kids rolled their eyes and stuck to the pumpkin cornbread muffins I served with it, but I couldn’t get enough. We’ve made it several times now, and it’s just been a winner again and again. Just the thing when you’re craving something cozy! Make it mild, make it hot. If you’re spice-averse, start with 1/4 or 1/2 tsp of chipotle chili powder. You can always add more later! If you like it hot, start with at least 1 tsp chipotle chili, and maybe go up to 1 1/2 or even 2 tsp. What if I made it too spicy? Most people use cheese or sour cream to temper the heat of their chili. If you’re dairy free (like us) or vegan, I love using diced avocado or a dollop of this avocado ranch to cool things down a bit. They both really help. If you tolerate dairy, load up on the cheese/sour cream! Instant Pot vs. Slow Cooker. I was a pretty regular slow cooker user before getting my instant pot (now I use both). I love and swear by this slow cooker, which is programmable and really easy to use. If you’re in the market for an Instant Pot, I’ve been very happy with the 6 quart size. (If you’re cooking for a crowd, you might be happier with an 8 quart.) There’s definitely a learning curve to the Instant Pot, so if you’re nervous, feel free to stick with the slow cooker or stovetop directions. Leftovers. This freezes and reheats like a DREAM. Divide into freezer-safe bags and lay flat to freeze or use an airtight freezer safe container (make sure to leave room at the top for expansion!). I love using leftover chili for rice or quinoa bowls, or making chili stuffed spaghetti squash. So good! Press SAUTE mode and add olive oil to Instant Pot. Add onion and bell peppers, and saute 4-5 minutes, or until softened. Add garlic, beans, and tomatoes. Add salt, pepper, chili powder, cumin, smoked paprika, and chipotle chili powder. Pour over broth. Stir to combine, then cover with lid. Be sure the steam release handle is set to SEALING. Press CANCEL (to cancel SAUTE mode) then press BROTH/SOUP (or cook on manual by not selecting a specific setting) and set to cook 20 minutes. After 20 minutes, carefully perform quick release by switching steam release handle to VENTING. Allow to vegan until pressure seal (float valve) drops down. Carefully open Instant Pot and serve! STOVETOP DIRECTIONS: Heat olive oil in a soup pot or Dutch oven over medium heat. Add onion and peppers and saute 5-7 minutes, or until translucent and tender. Add garlic and cook 1 minute more. Add beans, tomatoes, seasonings, and broth. Stir to combine. Bring to a boil, then reduce to a simmer. Stirring periodically, simmer chili at least 20-30 minutes, to allow flavors to blend. SLOW COOKER DIRECTIONS: Add all ingredients to slow cooker. Stir to distribute evenly, then cook on HIGH for 3-4 hours or LOW 5-6 hours. *MAKE IT MILD, MAKE IT HOT. If you’re spice-averse, start with 1/4 or 1/2 tsp of chipotle chili powder. You can always add more later! If you like it hot, start with at least 1 tsp chipotle chili, and maybe go up to 1 1/2 or even 2 tsp. « Five Fact Friday – A Lovely Love Day!